Sometimes, it's the little competencies that make you a hero: The ability to clean a fish. Reattach the toilet stopper. Roll a blunt. 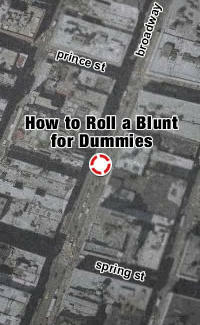 For help with the latter, buy How to Roll a Blunt for Dummies*. Blunt's a glossy, self-published paperback by avowed blunt-head R. Prince. Within its 124 pages is everything you ever wanted to know about the Dank Science: blunt variations (Phillies vs. White Owls vs. Dutch Masters), preparing ingredients, rolling, inhaling, and more. Prince also delves into more controversial subjects, like fending off "blunt predators" and tips for enjoying paranoia. On the back cover, you'll even find a designated area to break down your weed, entitled "Designated area to break down your weed". But Blunt's more than just a manual -- it's an investigation into a culture filled with history, legend, and cautionary tales. Remarkable among these is an interview with Marion Ford, the only man to ever seek psychological counseling for his chronic blunt-holding: "Subconsciously, by holding the blunt, I'm hoping that other people in the session will forget that I have the blunt." So even if you're inept at other, legal skills, go find R. Prince at his table. Armed with his knowledge, you'll master this art. Because in our own ways, aren't we all just holding the blunt? *This book has no affiliation with the "For Dummies" series. It does, however, have an affiliation with getting stupid.